Rodolfo Calfa, known in Capoeira as Professor Titan is the one leading Axé Capoeira in Hong Kong, he was born in the city of São Paulo, Brazil, in 1982. His first contact with capoeira was in 1994 at the age of 12, where he met Mestrando Andrezinho, one of the first students of Master Eddy Murphy, with whom he has trained for years and participate in countless Capoeira events throughout Brazil. In 2005 he had his first international experience, where he toured for 3 months in Latin America. In 2006, he was invited to be part of the cast of Cia. Fire of Brazil; which offered him the opportunity to travel around the world to expand his knowledge by divulging his art. 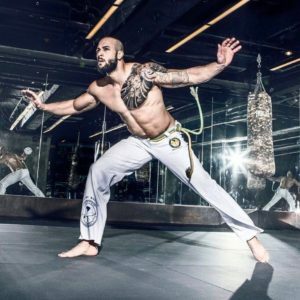 In the same year, he was invited to be part of the First Capoeira Event in China, administering capoeira classes and Workshops in China and Hong Kong. After his long journey abroad, Instructor Titan returns to Brazil in 2011, becoming one of the leaders of the Axé Capoeira Group in São Paulo. In 2013, he held his first capoeira event, with renowned Masters of Capoeira as Master Barrão, Master Eddy Murphy among other illustrious Masters and Teachers of Capoeira. Still in 2013, Instructor Titan is invited by Master Eddy Murphy to develop capoeira work in Asia (Macau). Since then Instructor Titan was invited to give workshops and public demonstrations in many countries, such as: Uruguay, Argentina, Chile, Paraguay, Turkey, Germany, Czech Republic, Russia, Austria, France, Angola, Canada, England, Philippines, Singapore, Malaysia, China, Switzerland etc. Today he dedicates his life to the art of capoeira, teaching and expanding the greatest Brazilian cultural expression leading the group Axé Capoeira in Hong Kong.